Railpictures.ca - Mike Molnar Photo: A loaded wind turbine tower train enters the double track at CP Humber in Vaughan. I’d like to thank the person who cut holes into the fence on this overpass for making this photo possible. | Railpictures.ca – Canadian Railway Photography – photographie ferroviaire Canadienne. 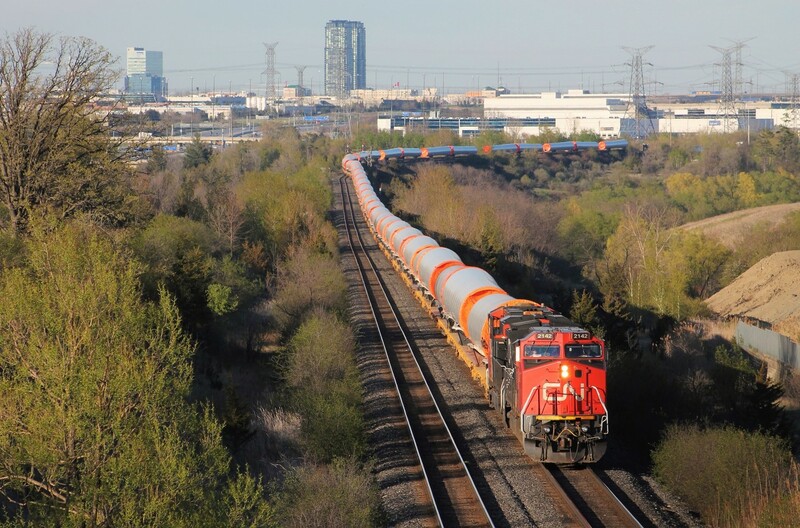 Caption: A loaded wind turbine tower train enters the double track at CP Humber in Vaughan. I'd like to thank the person who cut holes into the fence on this overpass for making this photo possible. Thank you Kevin and ngineered4u for the compliments! Ahh…Geez…Thanks for the warning….taking cover now.. It is an amazing shot. LOL I used to wish that I was a railfan and could get some really awesome photos of trains crossing the Humber. Well done. Oops my mistake. I’ve been spending too much time in Ohio lol. What are great shot…love the location. You can see the train for a great distance, and it’s got the 407 in the background. I find it interesting that about 50% of the time I’m on the 407 driving past the Humber bridge, I see a train…same for the BIT overpass. Probably not advisable to make a last minute stop and pull over at the side of the 407 for a shot! They are not called control points at CN.